It's almost Valentine's Day!!! This is my Christmas. I love Love and I reallyyy love Valentine's. It means folks are sharing and showing their love for one another and that makes me super happy. As I've mentioned before, it's also my anniversary and I remember trying to create a wedding day/evening that was a big, love-ly date for everyone that attended. I also remember flowers being extra insanely expensive on THIS day. Now don't get me wrong, I adore flowers. I delight in receiving them and even gift them to myself quite often. However, I also like a good bargain for my buck and it pains me to know that lovely dozen roses cost 3x's as much as any other day of the year and they'll be in the trash in a week. Boo. 1. Sonix Snake Heart Phone Case :: I have had this exact case for about 1/2 a year and it's been awesome. My phone is still in perfect condition under this cute layer of armor and I know this because I just replaced it with their Gummi Bear (#spiritanimal) phone case. BUT I truly loved the tough but tender snake and heart cover as well. File this one under USEFUL & beautiful. 3. 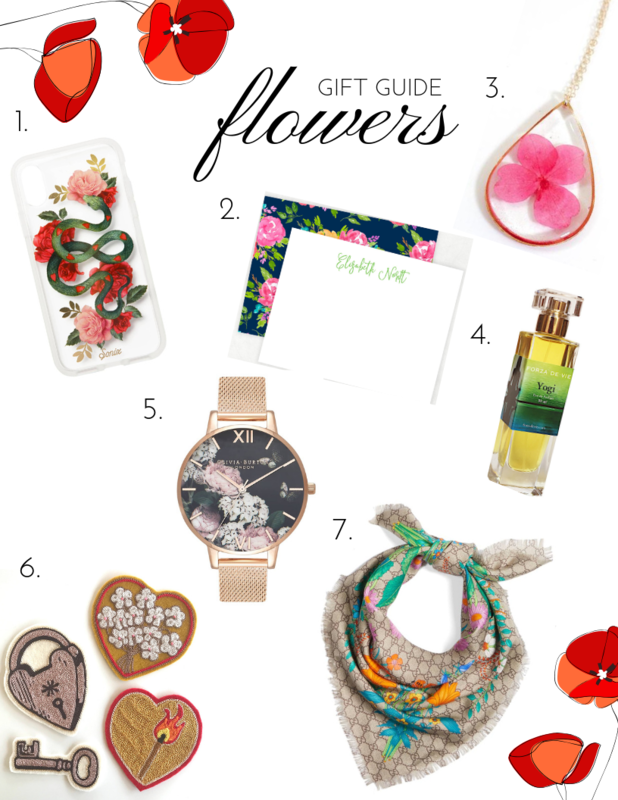 Floral Jewelry :: SO many romantic options here. Choose a flower charm or pressed flower pendant based on birth month or just because you know they love daisies. Remedy Design Shop (I love her lucky charm necklace) offers sweet forget-me-not earrings and necklace options. Carissa makes custom orders as well and is local to Austin if you want to use petals from a wedding bouquet or another special occasion. She's sharing 20% off our orders with code VALENTINES19. Yay for a LASTING & PERSONAL idea. 4. CRAFT Workshops :: Make it a date night with gals or your sweetie - CRAFT has some amazing floral themed options coming up on their calendar. Perfume making, flower arranging and floral embroidery classes all offer a chance to enjoy and EXPERIENCE something NOVEL together. 5. Olivia Burton Floral Watch :: Now these are stems you can peek at day after day. This USEFUL item is sure to please. 6. Die Trying Patches :: If cupid wore a jean jacket, he'd totally be rocking these sweet patches on it. I am in love with everything this little Austin-based shop is creating. I was sad to miss their on-site bandana personalization at the Armadillo Xmas Bazaar. Yes, they will chain stitch any pet name or term of endearment you want on a beanie or a bandana. But it's their sassy patches I'm in love with. From a sweet bouquet to a rose-studded skull, you'll find something unique & NOVEL here and no where else. Bonus, they're iron-on, so no sewing skills needed but they do give you a cute sewing kit with purchase. 7. GUCCI Floral Scarf :: If your wallet just needs that mid-February splurge to feel 'right,' then do it on this scarf. It's a gorgeous blend of those classic interlocking G's and springy wildflowers. Like a leopard print, that brown double G print is basically a neutral so wear it with everything forever 'cause this piece is a LASTING gift that will never go out of style.